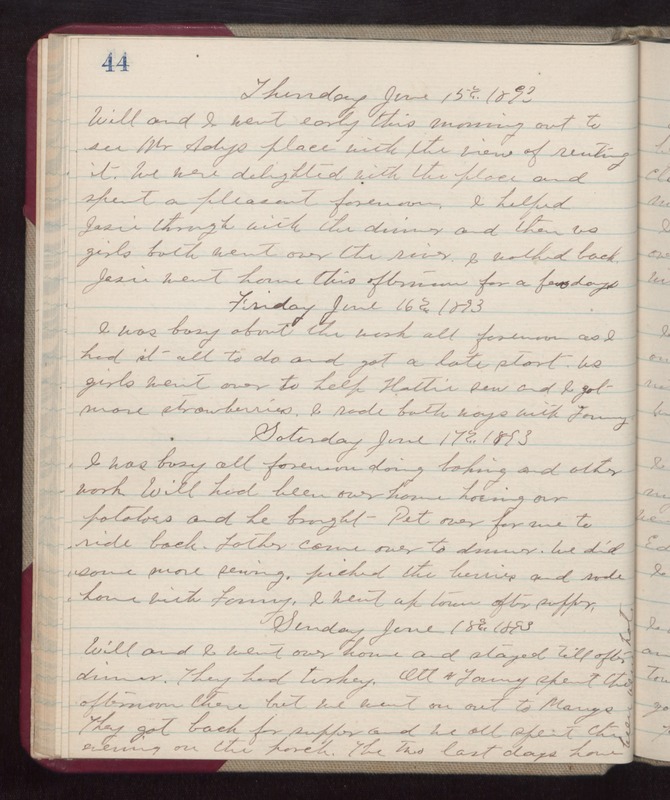 Thursday June 15th 1893 Will and went early this morning out to see Mr Adys place with the view of renting it. We were delighted with the place and spent a pleasant forenoon. I helped Josie through with the dinner and then us girls both went over the river. I walked back. Josie went home this afternoon for a few days. Friday June 16th 1893 I was busy about the work all forenoon as I had it all to do and got a late start. Us girls went over to help Hattie sew and I got more strawberries. I rode both ways with Fanny. Saturday June 17th 1893 I was bust all forenoon doing baking and other work. Will had been over home hoeing our potatoes and he brought "Pet" over for me to ride back. Father came over to dinner. We did some more sewing, picked the berries, and rode home with Fanny. I went up town after supper. Sunday June 18th 1893 Will and I went over home and stayed till after dinner. They had turkey. Ott & Fanny spent the afternoon there but we went on out to Marys. They got back for supper and we all spent the evening on the porch. The two last days have been very hot.